If you stand along Magnolia Circle between the Edgehill Ave. and the Home Economics Building and face the fence of the day care center, you will see this red mulberry tree. The leaves of red mulberry are the best way to recognize this species. As the main veins approach the margin of the leaf, they loop around until they are parallel to the margin. 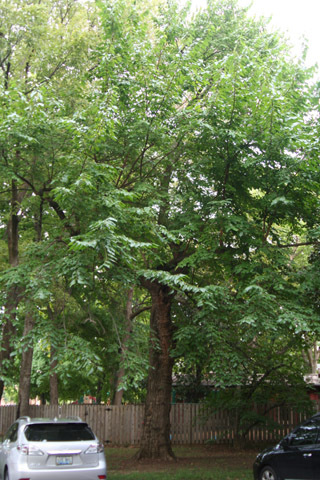 Red mulberry is also one of the few trees with leaves that can be mitten-shaped with a single lobe "thumb" on one side. The other tree that commonly has leaves like this is sassafras, but sassafras leaves differ from mulberry by having untoothed margins. The mitten leaves are not always a good way to recognize red mulberry, because sometimes a tree will have few, or even no leaves that are mittened. If the tree is a female, you may also find its fruits in the summer. They change from red to black as they ripen. Red mulberry is the only mulberry that you will commonly find in the wild in this area. It is often a small tree or shrub, although it can become a large tree. This organism is a living specimen that is part of the  Vanderbilt University Arboretum  with the local identifier 1-314.